Knead until the dough is soft, and portion into 16 equal balls. Slather each portion with a teaspoon of ghee. Cover lightly and allow to rest at room temperature for 4-6 hours. Boil the potatoes until cooked, the mash with a potato masher. Set aside. Remove the husk, and soak the dried tamarind in ½ cup of water until soft. Then mash it in the soaking water. Strain through a sieve and reserve the water. In a wok, heat some oil and fry the onions, garlic and ginger until golden. Next, mix the curry powder, garam masala with some water and add to the wok. Fry the ingredients until the oil splits and add in the tamarind water. Add the minced meat and mashed potatoes. Fry until the stuffing is dry and season with salt to taste. Mix in the eggs with the meat stuffing. Put a portion of the minced meat into the center of the roti and roughly flatten with a spoon. 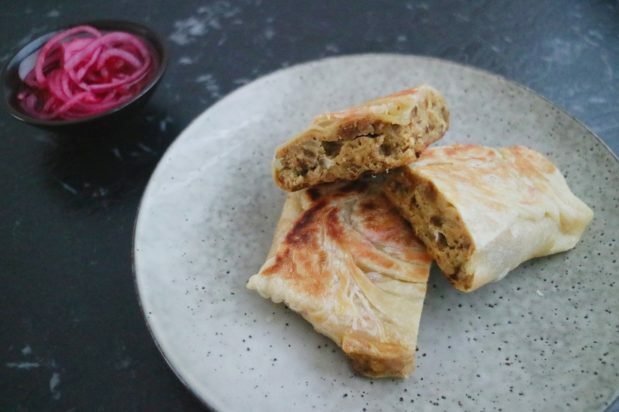 Fold the edges of the roti over the stuffing, to get a square shaped murtabak. Pan-fry until the surface of the murtabak turns golden brown, and flip onto the other side to brown. Serve hot.